3 to 6 inches of snow and sleet… With up to a tenth of an inch of freezing rain. Winter storm watch in effect from Wednesday afternoon through Thursday morning. 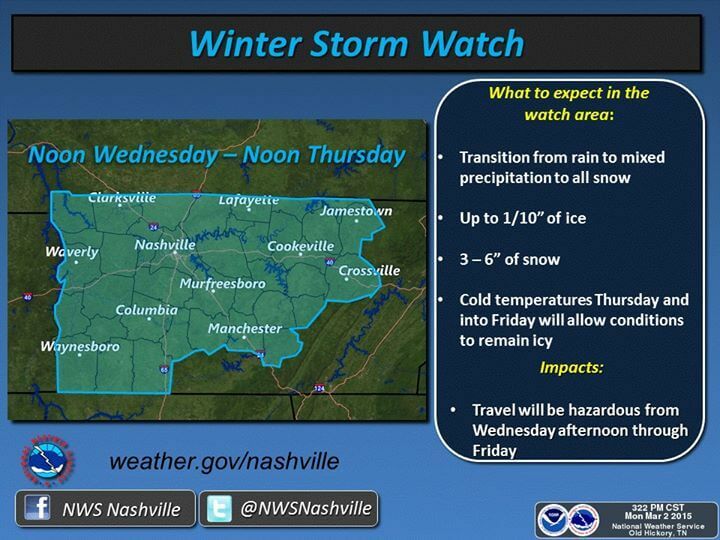 The national weather service in Nashville has issued a winter storm watch… Which is in effect from Wednesday afternoon through Thursday morning. Timing: From noon CST Wednesday through noon CST Thursday. Accumulations: 3 to 6 inches of snow and sleet… With up to a tenth of an inch of freezing rain. Main impact: A mix of snow… Sleet… And freezing rain will create major travel impacts from Wednesday afternoon through the day on Friday. Temperatures are likely to stay below freezing from Wednesday night through mid day Friday which may extend hazardous travel conditions through the remainder of the work week. Get prepared while you can. Trust in the Lord, and stay safe.